Last Friday was the first day of the Native Pant Sale at the Theodore Payne Foundation. We are re-doing our landscape to incorporate as many indigenous plants as possible. Early last Friday my mom and I trekked out to Sun Valley to purchase natives. 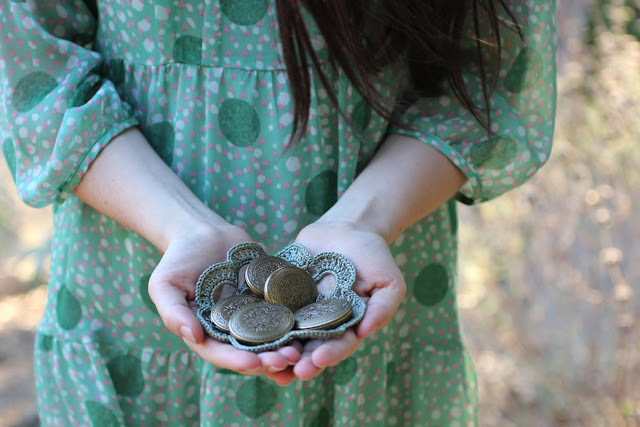 I arrived back in the Santa Monica Mountains with a treasure trove of new friends to plant into our clay soil. The first weekend sale is for members only. I purchased quite a few Ceanothus, which will cover the majority of the front slope, intermingled with Yarrow, Manzanita and Sage and Island Alum under the Oaks. We will need to return again for more plants. Planning the garden has been like formulating a painting or perfume. All the elements of design must be employed; texture, repetition, contrast, scale and a unifying theme. The Ceanothus consists mostly of 'Yankee Point' with a few 'Heart's Desire' and 'Centennial'. Eventually we will also plant more Oaks as well. I plan to experiment with all of these for the tinctures in my Californica series of perfumes. Some are already in Vera and Chaparral. 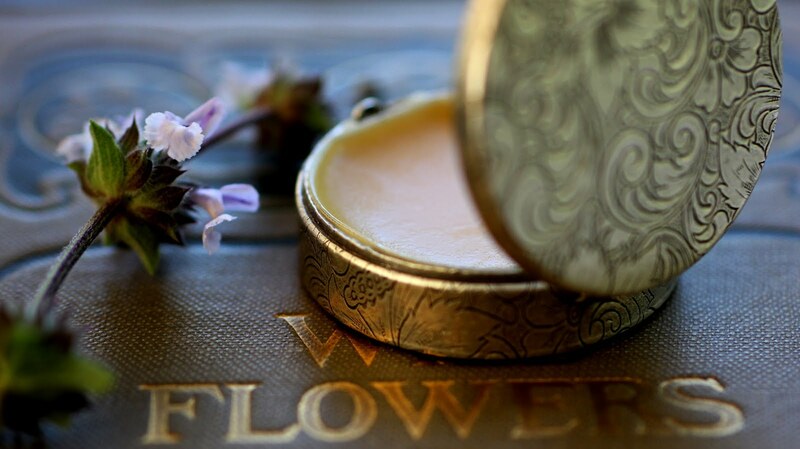 The new perfume to this series, Rosa and Sierra, also contain local native tinctures. Rosa and Sierra will be available soon. Thank You to all of you who have sampled them and are patiently waiting for the quarter ounce liquid perfume. Californica samplers will be available as well. 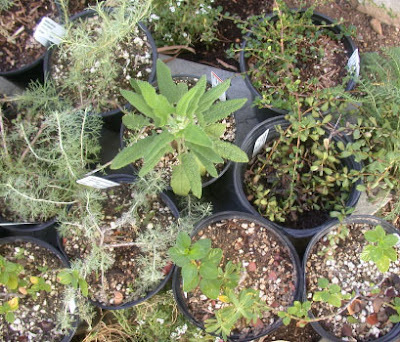 The Native Plant Sale at the Foundation opens to non-members this Friday. I suggest getting there early with a list and plenty of time. Plastic for the interior of your car, gardening gloves, full water bottle and a notepad are also a great addition for the trek. If you need help, seek out Louise, she is very knowledgeable and friendly. While you are there sign up to be a member. Membership helps support this important non-profit. Members get a discount on plants and classes, as well as receiving the Poppy newsletter filled with native plant garden tips. 1) Aesthetic Value: A native garden is stunning and fits the authentic beauty of California. 2) Once established native plants require very little water! 3) Genetics, these native plants only exist in California, the genetic material thrives here. Why create a garden with plants indigenous to the east coast of Europe when we have a plethora of 6000 species of plants. Natives are considered "Pre-European", they evolved without human impact. By continuing to plant natives we avoid genetic contamination and cross pollinating. A paradigm shift is required when we first begin to look at natives. The color and texture palette is quite different. 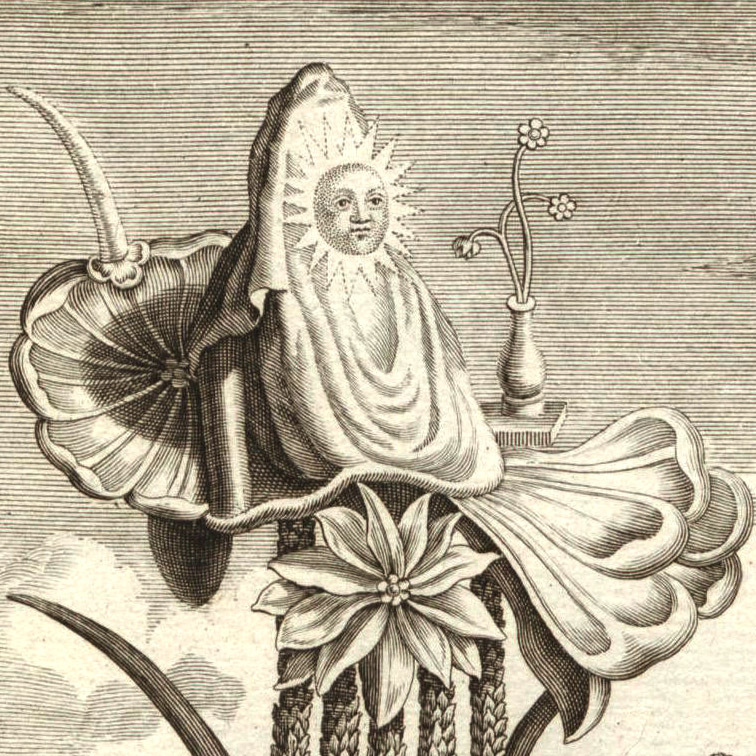 Similar to the adjustment when we shift from synthetic to botanical perfume. We make a choice that positively impacts our health and the wellbeing of the land. dam. SBBG offer several docent guided tours which I highly recommend. When you become a member of the Theodore Payne Foundation you will be given a fantastic book, conveniently in both English and Spanish. Another fantastic book is California Native Plants for the Garden. This photo was taken in 2005 at the SBBG. 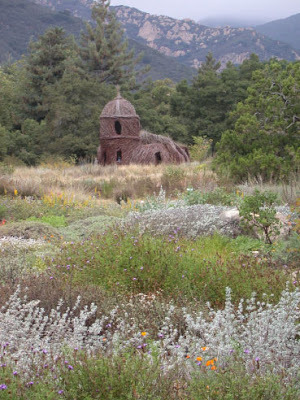 The structure in the background was created by Patrick Dougherty.